Looking to show off your photography skills? In line with the Halloween season this month’s photo competition theme is creepy crawling critters. Think bugs, flying creatures, and just all things crittery. 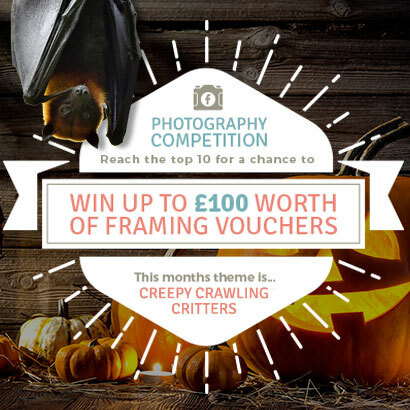 PRIZE DETAILS: £100 worth of framing vouchers for the winning entry, £50 for the runner-up and £10 worth of framing vouchers each for the rest of the top 10 entries. All redeemable at Picture Frames Express. And the chance to feature on our website. Not eligible to enter? - Find contest where you are. COPYRIGHT: All photos submitted must be the work of the individual submitting them, who must also be the copyright-holder. Each entrant is responsible for ensuring any image they submit has been taken with the permission of the subject and does not infringe the copyright of any third party or any laws. USAGE RIGHTS: By submitting an entry, you are granting Picture Frames Express permission to feature your image on their site, blog and any other websites or promotional materials connected to this competition, although all copyright for the image remains with the respective entrant.